DeepWars has one week left in their "mini" Kickstarter campaign. They're doing great and have listed some more stretch goals. The DeepWars Guardians of the Abyss Mini-Kicker is starting its final week and has unlocked another miniature, the Hydraform Light Combat Mech for the Ancients force. It is close to unlocking a weapons pack and then the mighty Nautiloid Chrysalid for the Dark Mariners force. 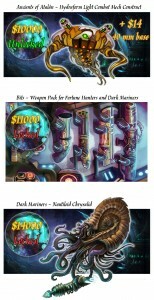 Help support the game and unlock some more creatures of the deep.